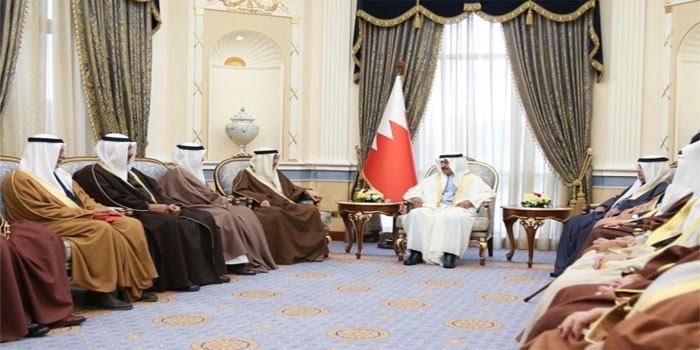 His Royal Highness Prime Minister Prince Khalifa bin Salman Al Khalifa received senior Royal Family members and officials, at the Gudaibiya Palace today. HRH Premier asserted that achieving a better life for the citizens in various fields is a government priority, noting that empowering the Bahraini citizens and making them effective contributors to building and developing their nation are the goals of continuous efforts to build the Bahraini society. HRH the Prime Minister highlighted the importance of national cohesion in strengthening national unity and increasing national gains, in light of the Bahraini people’s dedication, giving and distinction. HRH Premier stressed the role of Bahraini competencies in enhancing the development and progress march currently witnessed by the kingdom. HRH the Prime Minister exchanged cordial talks with those present on local issues.